How about a little Stadium (Series) love for four teams, two who are state rivals, the other duo longtime foes, who took things outside over the weekend? The conditions were vastly different with the temperature gauge reading 63 degrees Farenheit (17 degrees Celsius)for puck drop on Saturday night at Dodger Stadium, featuring Los Angles and Anaheim; and nearly 24 degrees Farenheit (-4 degrees Celsius) Sunday afternoon at Yankee Stadium with New Jersey and the New York Rangers headlining. Regardless of the temperatures, the intensity displayed by all was very much the same. Jonas Hiller, who’ll be in net for Switzerland at the upcoming Winter Olympics, made 36 saves as the Ducks bested the Kings 3-0 in front of 54,000-plus fans, with Wayne Gretzky dropping the ceremonial face-off. What an amazing night @ dodger stadium! Hope the fans had as much fun as the players did last night.Such a great experience to be a part of! Anaheim won their 21st games in 24 contests, while Los Angeles suffered their fifth straight loss. Corey Perry, who’ll suit up for Team Canada, netted his league-leading ninth game-winning tally of the season. Rick Nash, also on his way to the Olympics (Team Canada), scored for the fifth consecutive game, as the Rangers scored four times in the second period to take the lead for good en route to a 7-3 win. Mats Zuccarello, who’ll play for Norway in Russia, netted a pair of goals in the Rangers triumph. 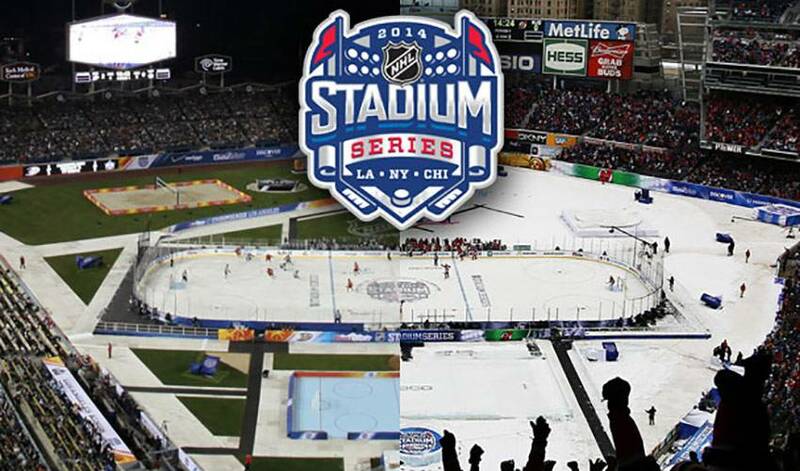 The Rangers set a regular-season outdoor NHL game record with seven total goals, besting the previous mark of six established by the Detroit Red Wings in the 2009 Winter Classic at Wrigley Field in Chicago. Henrik Lundqvist, who will represent Sweden in the 2014 Winter Olympic Games, made 19 saves to pick up his second regular-season outdoor NHL game victory, matching Ty Conklin for the most wins. Lundqvist recorded 34 stops, including a penalty-shot save in the final seconds of regulation, to seal New York’s 3-2 victory over Philadelphia in the 2012 Winter Classic at Citizens Bank Park.